​A lifelong love of all things flora and fauna combined with a love of working with colours and shapes has inspired Helen to translate the beauty of Mother Nature into wall and wearable art, using slightly abstract forms, impressionistic shapes and vibrant colours, all working together to exaggerate the natural environment around her. Helen works very much from intuition and experimentation, over time she has developed her own unique style. 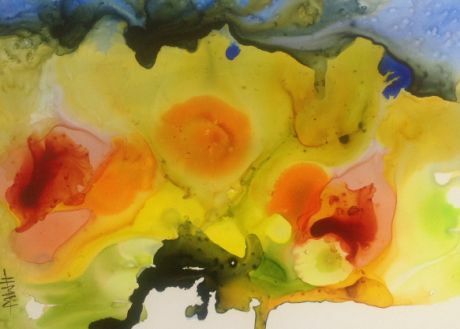 Helen has worked with most mediums, but particularly enjoys working with Oil Paints or Inks for intenseness, purity, freshness and playful colour interactions. Helen works on various support materials including but not limited to; Yupo Paper, Watercolour Paper and Silk. Complimentary to her framed artworks Helen has a passion for creating wearable art. Foliage collected from around her home studio is used for creating chromatically beautiful printed silk scarves. This same plant life has also been the foundation for the dramatic coloured silk scarves she creates similar to her vibrant Ink wall art. In 2017, Michael Sukkar, Federal MP, presented Helen with a Deakin Community 2017 Finalist Award. The award was in recognition for her involvement and commitment to the Ringwood Art Society and promotion of Art within the community during her 4 years as President.